While downloading GNU/Linux ISO files, you may find some torrents have slow speed because the tracker being inactive. Often, this problem can be solved by adding more trackers, especially if they provide more seeders for your ISO being downloaded. Fortunately, you don't have to find out trackers manually as there are many, many people out of there sharing list of them for you (even annually!). 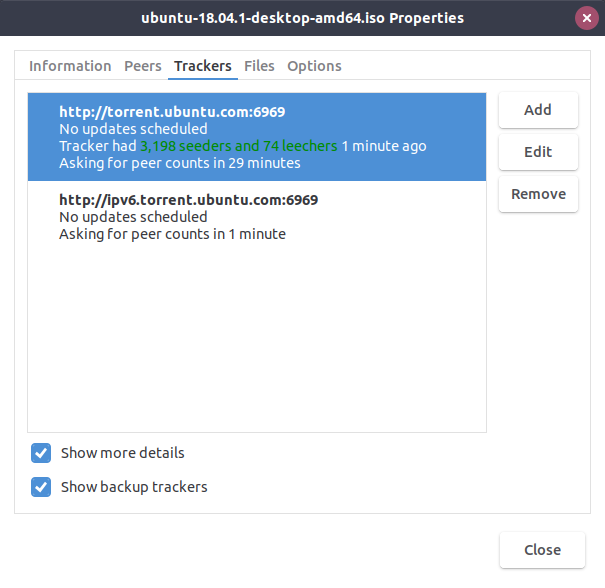 This short tutorial shows how to do it by example Ubuntu 18.04 torrent. Enjoy! See also step by step guide to download GNU/Linux via BitTorrent. Initially, I thought the way to add multiple URLs is by clicking Add button. Apparently I was wrong, as the correct button is Edit. You find it under the torrent being downloaded > Properties > Trackers > Edit. 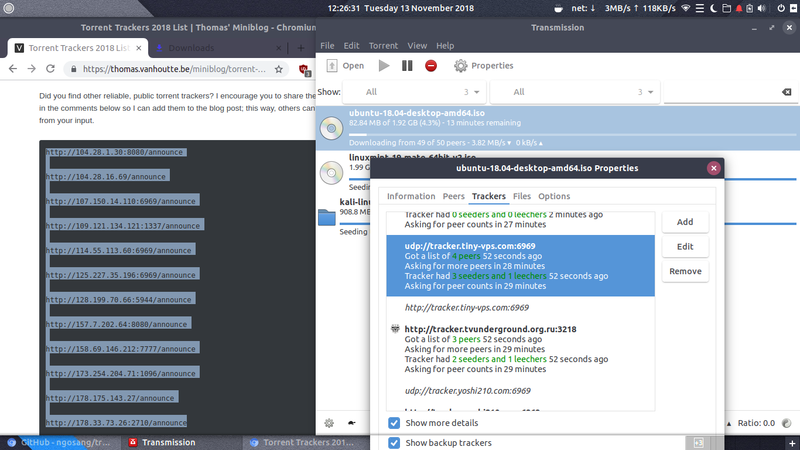 See torrent trackers list 2018 by Thomas. Or other list. Or one more list. 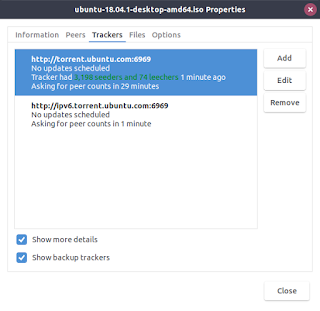 Latest LTS version of Ubuntu is currently 18.04 and the first point release 18.04.1 has been released as well. 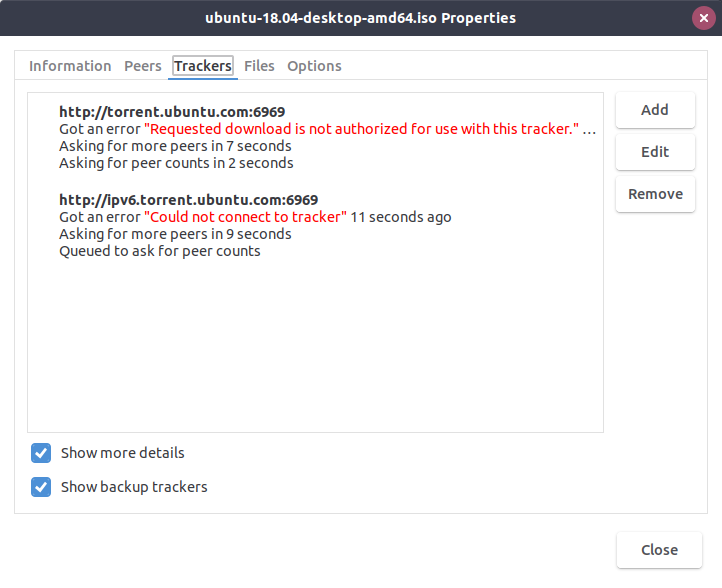 This means original Ubuntu tracker won't serve you if you insist to download 18.04 instead. It won't give you peers ("seeders"). So, you may find you cannot download or have rather slow speed. See comparison below. 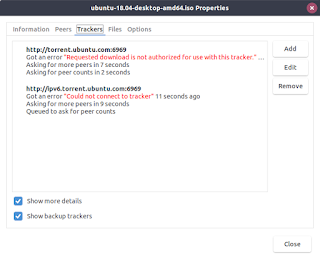 This comparison shows that some torrents could have inactive trackers despite the actual file(s) are downloadable. If the trackers are inactive, then you may get no peers ("seeders"), so you can not download. So, how to get more seeders? By getting another trackers, of course. If you can get multiple trackers, good chance you will get many many more seeders as well, and in turn you will get greater speed. 2) Then open it with Transmission. 3) Let it download first. 4) Now right-click the torrent being downloaded > Properties > Trackers > Edit. 5) Go to list of torrent trackers like, for example, see link above. Copy URL addresses as many as possible from there. 6) Paste URLs on the Edit Trackers on Transmission. 7) Right-click on the torrent > Ask Tracker for More Peers > done!